Cities around the world are frequently flooding during extreme weather, largely because they are fast losing the wetlands that work as a natural defence, experts warn. The warning follows an alarming recent report that the world's wetlands are disappearing three times faster than forests. The recent study by the global wetland convention found that nearly 35% of the world's wetlands were lost between 1970 and 2015. Latin America has seen the highest rate of loss - nearly 60% in that period - while Africa lost 42%, according to the report. To safeguard flood control and other benefits, the international meeting on wetlands has launched accreditation for cities that conserve wetlands. Under this scheme, 18 cities around the world have so far been recognised as conserving their wetlands. Expanding cities frequently encroach on wetlands because they are often viewed as wasteland to be used for other purposes, such as dumping sites. About half of the world's population today lives in urban areas and the figure is expected to increase to nearly 70% by 2050. "The idea of accreditation for cities is to make them realise the value of wetlands and to integrate them into urban planning," Lew Young, a wetland expert with the Wetland Convention, told the BBC. "On the top of the list of benefits of having wetlands is an increased resilience against natural disasters, including Tsunamis." Scientists have long warned that climate change will bring extreme rainfall and powerful sea-storms that could flood cities. They say lakes, marshlands and river-floodplains absorb excess rainfall, while saltmarshes and mangroves work as a buffer against storm surges. Some experts also claim inland wetlands are five times more economically valuable than tropical forests. They provide - directly or indirectly - almost all of the world's supply of freshwater, and so are critical to human and planet life. 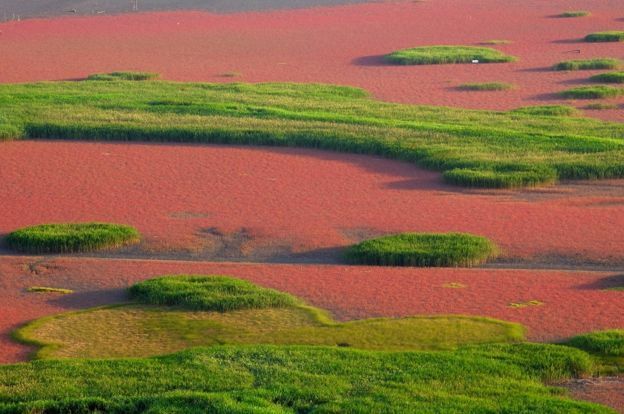 The recent report by the Wetland Convention said more than one billion people depended on them for a living, and 40% of the world's plant and animal species lived and bred in wetlands. The convention warned, however, that wetlands remained dangerously undervalued by policy and decision-makers in countries' national plans. Killer whales are in deep trouble because of persistent chemical pollution in the environment, researchers say. A new study suggests the long-term viability of more than half of the different orca groups around the globe is now in question. Some populations, such as those around the UK, the Strait of Gibraltar, off Brazil, Japan and California, are almost certainly doomed. The assessment is in Science magazine. The issue is polychlorinated biphenyls, or PCBs. These chemical compounds were once manufactured in vast quantities, and used in everything from plastics and paints to electrical equipment and sealants. But they are highly toxic and although banned decades ago have amassed in the environment, leaching into the ocean. Killer whales, or orcas, are top predators so they absorb all the PCB pollution taken in by the different prey in their food chain - from fish, right up to seals and sharks. The PCBs stunt the ovaries of female orcas, limiting their ability to produce calves. The chemicals also suppress the immune system. What is the outlook for orcas? The new study models the future of the killer whales' reproductive success and survivability against the chemical challenge. For those populations living in clean waters, it is positive. Orcas in places like the Antarctic and the Arctic should increase their numbers. But for those living in the most polluted seas, the next 30-50 years will be grim. The killer whales that live on the west coast of Scotland, for example, are now down to just eight individuals and they have not produced a calf in more than 20 years. Paul Jepson, from the Zoological Society of London, says this group will "disappear in my lifetime". "Over 50% of the populations that we've got data for will actually collapse in our model," he told the BBC's Science In Action programme. "PCBs are such highly toxic chemicals, and they persist in the environment. And it's the killer whales that have by a long way the highest exposures now of any species on Earth; certainly any mammalian species." 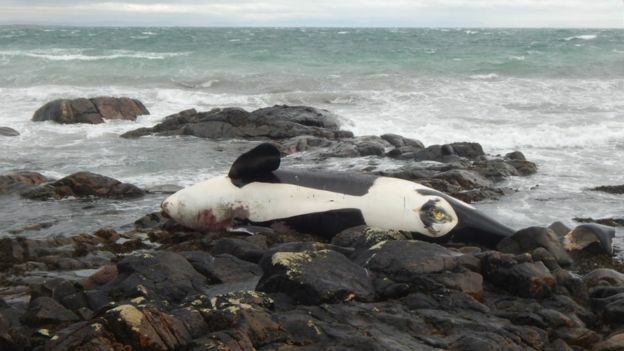 The Scottish orcas have been found to be heavily contaminated. Why are the animals so exposed? Everything in this story works against the killer whales. Not only do they accumulate contaminants because of their position as top predators, but the toxic effects hit them where they are particularly vulnerable - in their ability to reproduce. These are animals that take a long time to reach sexual maturity and even then have perhaps one calf every few years. This puts very precise pressure on a population. In addition, PCBs are soluble in fat - and killer whales are extremely fat-rich animals. A mother's milk will be loaded with PCBs which she will pass on to her offspring during lactation. How do we tackle the PCB legacy? Most PCBs have yet to be destroyed or safely stored away. Some countries have done better than others. In the US, where federal "superfunds" have been used to clean up the most heavily contaminated sites, PCB levels entering the ocean have come down. But there needs to be much more urgency in places such as Europe. "Improper disposal of PCB-containing equipment in landfills may lead to leakage and leaching of PCBs into nearby streams, river, estuaries, and ocean," said lead author on the new report, Jean-Pierre Desforges from Aarhus University, Denmark. "We know that PCBs were used in paints and sealants in old buildings and for outer coating on ships, so if contaminated building materials are improperly disposed of they could also reach the environment, and demolition of buildings may cause PCBs to enter the air." Can we help the orcas themselves? There is very little that can be done to recover the PCBs once they have reached the ocean. And the robustness of the chemicals means they will hang around in the environment for a very long time. But there are parallel problems we could conceivably fix, said co-author Ailsa Hall from the Sea Mammal Research Unit at St Andrews University, UK. "We should recognise that this is just one of many stresses on the animals," she told BBC News. "There are things such as noise, changes in habitat, changes in the availability of prey - that we do have influence over. And if we do something about these factors, maybe we can reduce the overall burden of stress, and perhaps then our predictions won't be so dire." Paul Jepson added: "I don't think there'll ever be another PCB story. "I think the chemical industries have learnt the lesson - we know that being fat-soluble is a big risk factor, because that allows things to bioaccumulate. "So, nowadays, no chemical with those properties would be allowed. But PCBs are so difficult to get rid of that we'll be dealing with the legacy for a long time." Presented by The Sechelt Arts Festival, EUTIERRIA - at one with nature, CONCERT, will run October 19th - 21st at the Sechelt Botanical Gardens. This all original musical work by award winning composer Kenneth Norman Johnson, with script and additional lyrics by Nancy Pincombe is sure to be a crowd pleaser. An all star local cast is well into rehearsals with solos and Choral work that are sounding great. Seating is limited. Get your tickets early! They're all around us, in the soil, our bodies and the air, but are often too small to be seen with the naked eye. They provide medicines and food but also wreak havoc by causing plant and animal diseases. According to the first big assessment of the state of the world's fungi, the fungal kingdom is vital to life on Earth. Yet, more than 90% of the estimated 3.8 million fungi in the world are currently unknown to science. "It's such an interesting set of organisms and we really know so little about them," says Prof Kathy Willis, director of science at the Royal Botanic Gardens, Kew, which led the report. "They're really weird organisms with the most bizarre life cycle. And yet when you understand their role in the Earth's ecosystem, you realise that they underpin life on Earth." Many people are familiar with edible mushrooms or the mould behind penicillin. But fungi have a range of vital roles, from helping plants draw water and nutrients from the soil to medicines that can lower blood cholesterol or enable organ transplants. Fungi also hold promise for breaking down plastics and generating new types of biofuels. But they have a darker side: devastating trees, crops and other plants across the world, and wiping out animals such as amphibians. Dr Ester Gaya, who leads a research project at Kew exploring the diversity and evolution of the world's fungi, says fungi are a bit like Dr Jekyll and Mr Hyde. "They can be good and also bad at the same time," she says. "The same fungus, it can be seen as a detrimental thing - it can be bad - but also can have a lot of potential and have a lot of solutions." The report sheds light on a number of gaps in our knowledge of a group of organisms that may hold the answers to food security. The fungal kingdom contains some of the most damaging crop pathogens. But fungi also recycle nutrients and play a role in the regulation of carbon dioxide levels. "We ignore fungi at our peril," says Prof Willis. "This is a kingdom we have to start to take seriously, especially with climate change and all the other challenges that we're being faced with." DNA studies show that there are thousands of different fungi in a single sample of soil, many of which are unknown and hidden - so-called "dark taxa"
At the last count, there were at least 15,000 types of fungi in the UK, some of which could be on the edge of extinction. Citizen scientists are helping to identify fungi across the country, adding to a database of more than 1,000 new records. Dr Brian Douglas of The Lost and Found Fungi Project says fungi are as beautiful as orchids and just as important to protect. "I think we need to teach people, invite people in to admiring fungi." Colleague Dr Oliver Ellingham adds. "Fungi is a whole another kingdom equal if not greater than in diversity than both the plants and animals." The first significant steps towards legally protecting the high seas are to take place at the UN in New York. These waters, defined as the open ocean far from coastlines, are threatened by deep-sea mining, over-fishing and the patenting of marine genetic resources. Over the next two years, government representatives aim to hammer out a binding agreement to protect them against over-exploitation. But several nations, including the US, are lukewarm towards the proposals. Experts believe that the oceans of the world are vital for a number of reasons. Scientists say they capture around 90% of the extra heat and about 26% of the excess carbon dioxide created by humans through the burning of fossil fuels and other activities. "The half of our planet which is high seas is protecting terrestrial life from the worst impacts of climate change," said Prof Alex Rogers from Oxford University, UK, who has provided evidence to inform the UN treaty process getting under way on Tuesday. "Yet we do too little to safeguard that or to protect the life within the ocean which is intrinsic to our collective survival. Protecting the biodiversity of the high seas by bringing good governance and law to the whole ocean is the single most important thing we can do to turn the tide for the blue heart of our planet." So what exactly does 'high seas' mean? The high seas are defined as the oceans that lie beyond exclusive economic zones. These zones are usually within 370km (200 nautical miles) of a country's coastline. These waters cover one and a half times the total land area of the planet and are home to some of the rarest and most charismatic species - but all countries have the right to navigate, fly over, carry our scientific research and fish on the high seas without restriction. Aren't these water already protected? In 1982, the UN adopted the Convention of the Law of the Sea (UNCLOS) which, when it became active in 1994, regulated sea-bed mining and cable-laying to some extent. There are also a host of other international groups, including the International Whaling Commission that look after aspects of the seas, but there is no overarching treaty that would protect biodiversity or limit exploitation. What are the big threats to the high seas? Researchers believe the high seas may be a major source of mineral resources in years to come. Just last year, a team of British scientists exploring an underwater mountain in the Atlantic Ocean discovered high concentrations of a rare and valuable substance used to build solar panels. They're not the only ones - companies are also targeting deep-sea hydrothermal vents, home to a range of extremely rare and often exotic species. The undersea world far from shore is also of growing interest because the strange and wonderful creatures that live there may lead to new pharmaceuticals - certainly a select group of research bodies believe this to be the case with 84% of patents related to marine species filed by just 30 institutions over the past 30 years. It's the same story when it comes to fishing. Ships from 10 rich countries - among them Japan, Korea and Spain - take around 70% of the catch. Several studies using satellite data have shown the scale of fishing taking place away from national waters, including the practice of unloading catches on to other ships in international waters, something that allows boats to evade monitoring and enforcement. How would a new treaty work? There would be three likely elements to any new treaty. Firstly, it would allow the setting up of Marine Protected Areas in international waters - something many countries have already done in their own jurisdictions. A new pact would also allow the carrying out of environmental impact assessments to guard against potential harm from activities on the high seas. In addition, a new, legally binding deal would allow poorer countries to benefit from any discoveries developed from marine genetic resources. "A strong global ocean treaty would allow us to create a network of ocean sanctuaries to protect wildlife, ensure food security for billions of people and help us to tackle climate change," Sandra Schoettner, a marine biologist with Greenpeace, told news agencies. Why are some governments reluctant to support the treaty? The US rejected the UNCLOS treaty back in 1994 and is reticent about these new proposals. Some whale-hunting countries, such as Japan, Iceland and Norway, are said to be cautious about the idea because they fear it will restrict their fishing operations. Russia is also said to be dragging its feet. Campaigners, though, are optimistic that eventually a deal will be reached. "This is a historic opportunity to protect the biodiversity and functions of the high seas through legally binding commitments."